Hollywood on the Potomac: Sea to Shining Sea Actor Beau Bridges reveals his seafaring connection at The Lone Sailor Awards. Life of the Party: Lone Sailors Honored Baseball, C-SPAN and Hollywood dominated the Navy’s Memorial Lone Sailor Awards this year. 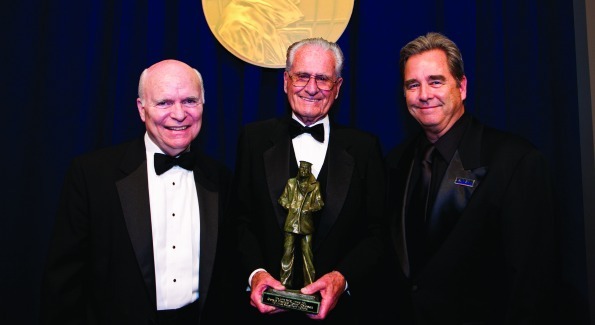 Award winners: C-SPAN founder Brian Lamb, famed Major League Baseball second baseman Jerry Coleman and actor Beau Bridges. Photos by Ralph Alswang Photography. Actor Beau Bridges reveals his seafaring connection at The Lone Sailor Awards. Move forward to the Cuban blockcade…. “When Kennedy put up the Cuban blockade we thought we were going to war against Russia. There was talk of a draft. I was 17 and my dad said, ‘Son, maybe you better pick your branch of the service and join up.’ My dad was doing a series at that time called ‘Sea Hunt.’ He had met a lot of the Coast Guard on set.” He subsequently received the Honorary Commodore Commission, which is part of the reason why Beau received the award — to honor his father; an ocean away from Liverpool.